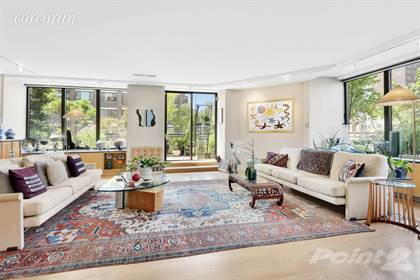 "Extraordinary features come together in this sun-filled, high-floor corner 8.5-Room condominium high atop the Gold Coast of Manhattans Upper East Side. Not only does the home showcase breathtaking open city skyline views from every room and from 4 exposures, the home features its own 1,450 square foot landscaped wrap terrace. This rare one-of-a-kind combination boasts spectacular views spanning every direction and draws in beautiful natural light from abundant oversized windows throughout. Magnificent sunsets over the city are guaranteed! These magnificent vistas combined with gracious living, a huge outdoor oasis, condo ownership, a full-service building and superb location make this a remarkable residence. This expansive 4 bedroom, 3 full bathroom corner home features a fabulous flowing layout for entertaining that is well-planned for living. The vast, sun-filled formal expanse features an open loft-like living room and formal dining room surrounded by windows, open views and the wrap terrace. The outdoor space is a true garden oasis with lush plantings and is fully equipped with electricity and water. The elevator landing which is not shared with anyone provides additional space that has been customized to enhance the light and open feel of the home. Beautifully combined and designed, the apartment has been impeccably maintained by the same owner for many years. Custom features and high-end materials can be found throughout including exquisite millwork, vintage fixtures, marble bathrooms and pocket doors. Modern comforts include central air conditioning, a full laundry room, high-end stainless appliances including Bosch, Miele and Sub-Zero, a walk-in custom butlers pantry with dishwasher, sink and refrigerator and a truly extraordinary amount of custom-fitted storage throughout. The east-facing master suite is extraordinary with wide open city views. Exceptional custom-designed floor-to-ceiling closets maximize space and storage and were beautifully designed. The master bathroom is sublime and bathed in marble, complete with walk-in shower, deep-soaking spa tub and his/her vanities. In addition the suite is complete with a huge corner flexible room exposing both north and west open exposures that is currently configured as a home office/gym. Three additional bedrooms are all spacious with open city views. One is currently configured as a den/media room with a full custom beautifully designed entertainment center. Another bedroom features a full -bathroom en-suite and access to the wrap terrace. The last bedroom features custom closet storage and a full bathroom adjacent. " Hi, I'd like to find out more information about 45 East 80th Street. Thanks so much!